The cricket world has held their breath as Sri Lanka batsman Dimuth Karunaratne was hit in the back of the neck by a bouncer from Aussie quick Pat Cummins. Cummins’ delivery caught the opener off guard and saw him attempt to get out of the way of the rising ball. But his attempts were in vain as the ball slammed in between his shoulder and neck guard at a thunderous 142.5 km/h. He fell immediately to the deck where he stayed as players rushed in before trainers ran out to the pitch. After spending a few minutes checking over him, the trainers called for the stretcher as concerns around the ground began to grow. First reports are positive however with Fox Cricket’s Neroli Meadows reporting “he never lost consciousness” after being struck in the neck. The concern was immediate with training staff and medical personnel surrounding the star batsmen as Australia grouped together nearby. After roughly 10 minutes of laying on the pitch Karunaratne was lifted onto the stretcher with a neck brace on. As he was loaded onto the stretcher Cummins was quick to check in on his opponent. He was driven straight from the field and loaded into an awaiting ambulance where he’ll go have further medical attention. The Sri Lankan opener was closing in on a 50 as Sri Lanka started well at Manuka Oval. Cummins was coming around the wicket to the left-handed Karunaratne and was fell straight to the ground. 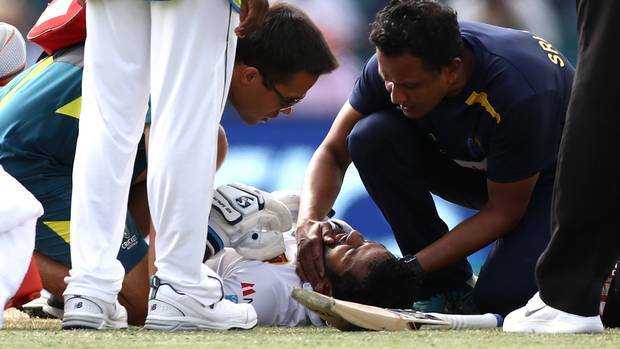 The 30-year-old laid on the ground for 10 minutes as medical staff brought on a stretcher, getting Karunaratne into an ambulance immediately after leaving the field. Channel Seven commentator James Brayshaw said it was “raw” for the cricket community after a bouncer led to Phil Hughes death on the field in a Sheffield Shield match in November 2014.